The “100-year flood” gets a lot of attention, but its name is a bit misleading. It simply refers to a flood that has a one percent or greater chance of occurring within any given year. It is increasingly referred to as the Base Flood to avoid confusion. The area expected to be inundated by the Base Flood is known as the Special Flood Hazard Area (SFHA). Some sites located within the mapped SFHA may actually be affected by a smaller flooding event. It is even possible to be inundated by multiple ‘100-year floods’ within the same year, although statistically unlikely. The Federal Emergency Management Agency (FEMA) estimates that 25 to 30 percent of floods occur outside of the SFHA. In 1968, Congress made FEMA responsible for the creation of flood maps nationwide. These maps are used to regulate development by local jurisdictions and to assess flood risk by property owners, insurance companies and lenders. Our currently adopted maps are based upon the maps FEMA originally created. As part of this mapping effort, FEMA performed detailed hydrological studies for the Willamette River and Amazon Channel. Other flooding sources in our area used approximate methods to determine the floodplain boundary. See the navigation links for information about specific flood topics, including information on flood insurance Please be aware that there is significant, recent information that is not covered due to ongoing Flood Reform. For information on how to prepare for a flood, visit FEMA or the CDC website. Learn more from the National Weather Service. Want to know if a property is in the SFHA? 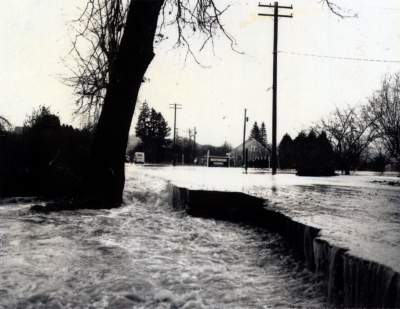 The City of Eugene provides free information regarding flood hazards for specific sites within the community and can answer many of your flood-related questions. Staff can assist with flood protection and mitigation design questions and with local flooding concerns. And we can make site visits. Offices are open to the public from 9 a.m. to 4:00 p.m., Monday through Friday. We strive to return all calls within one business day.